Life has its own rhythm and learning that is more fundamental to well-being than fostering an attitude of success. Think about how we give ourselves over to sleep at the end of every day. How like death is sleep! If you could see yourself asleep, it would look just like death. In sleep your temperature is different than in death but your conscious self is not present. Is it not amazing that life comes looking for us each morning! Life beckons us to move. To enter life requires us to get up, move our feet to the coffee machine and into life. Our attitude is of no relevance in the matter. Isn’t it more than odd that few greet the stunning invitation into life with joy? We’re comfortable in this death-like state. What a conundrum that our waking moments aren’t always bursting with anticipation. Wayside’s mission is for the sleeping. We understand that sleeping is needed for those who are tired. Our role is to invite people into life. We’re not much interested in what people think but rather we’re interested in getting people moving. 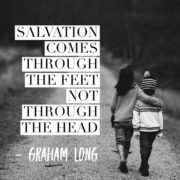 Salvation comes through the feet not through the head. We know well that our invitation is rarely greeted with joy. Most often our early work is with people who are annoyed because we’ve invited them into life and community while they have constructed a dream world in which they are the hero, the only one in the right in a world of evil. In dream life we are all rock stars and professors because there is no real person present to contradict us. How unromantic to move into a world where there are others, who come complete with their own dramas and who can laugh at us as well as love us. Wayside’s mission is in the real. Love never grows in a state of sleep. It’s why none of our ‘success stories’ are a simple matter of flicking a switch to fix someone or make them new. All of our successes are stories of three steps forward, two steps back. Since Professor Stephen Hawking died, I’ve been reading his most famous book. I’m loving it because it’s a bit of a head spin. It has made me realise that my education in philosophy is so thorough that my foundational understanding of science is fundamentally inadequate. It’s both a shock and a good adventure to have to rethink fundamental things. It wouldn’t matter how vivid your imagination is; no idea, no scheme, no construction could be as fantastic as the real world. Some weeks here are particularly tough. Three unexpected deaths of young people have caused some of us to struggle this week. Two of these were well connected to Wayside and one only known to me. Gosh, the pain of a Mum and Dad who’ve just lost their child or a sister who just lost her brother or a wife who just lost her husband! I’m not sure there is a shock more brutal than this. When these things happen there are staff here who love and care for those concerned and the sadness can be seen, heard and felt. Many of our staff have lost close family members to tragic events and in such times their own raw nerves wake up. The greatest task for me is to fight the urge to appear wise. There are no wise words and telling people it’s not their fault when they haven’t even heard their own self accusations fully, amounts to telling people not to feel what they feel. I stood on holy ground this week. I didn’t manage anything. If anyone expected me to fix anything, I was a monumental disappointment. One person asked me to pray and I prayed the psalm, “Out of the depths I cry to you O Lord…” Although I feel rather useless, I realise that sadness is an important, even beautiful human state and we can meet each other to some extent in such moments. As I’ve seen the tears of our staff, I’ve fallen in love with them and want to thank them for making this world not just loving but real, and really human. A young girl from South Sudan was separated from her father when one of the armed militias that roamed the country beat and imprisoned him. The girl thought that her father was dead. She and her mother and siblings had to do all they could to survive without their father. They found shelter in a derelict house that had no roof and because the mother couldn’t feed all her children, the little girl and her big brother were sent into Nairobi to beg or to eat as best they could from rubbish bins. The little girl was only ten years old at that time. While she was doing her best to survive, so too was her father. After he was captured, he was put in a hole in the ground with a steel grate across the top. He shared that hole with twenty other men for six months! In due course another militia invaded this area and set him and the others free. Running as fast as he could, he headed straight into the arms of a third militia who were suspicious of his story and locked him up again in another hole in the ground. After months of unspeakable punishment and abuse, this man was eventually released. 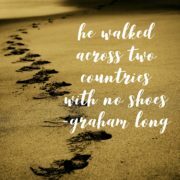 He walked across two countries with no shoes, sleeping in trees at night time to avoid lions. He had no idea if his wife and kids were still alive but he kept going and sought asylum. He was granted entrance into Australia in 1998 and I was part of the team who welcomed him into the community. It took two years and a superhuman effort, but we were able to locate this man’s wife and kids and reunite them with their father. A beautiful African face captured my heart this week in the crowd of people who came to register at Wayside as volunteers. It was this same little girl, now a beautiful woman. Today she is a registered nurse, giving professional and compassionate care in the medical system of this country and soon to be a volunteer at Wayside. We’ve just had our grandkids with us for six days. We love these kids more than we love oxygen in the air, even though we feel rather old by the time they go back home. Isn’t it just true that life comes when the comfortable options that we’d normally choose, are not available? We have a natural attraction to the most comfortable of our options but it is a trap! Engagement, not just with kids but with community in any form, is rarely convenient. 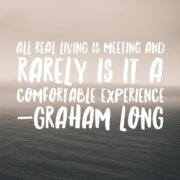 All real living is meeting and rarely is it a comfortable experience – actually if you’ve been reading my notes long enough, you might understand if I said, “all real living is meeting and it’s never an experience”. 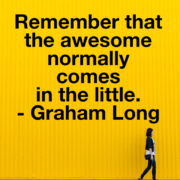 By the time you know how you feel about a meeting, the meeting itself is over. Life does not approach us from within but rather from without. Comfort is a characteristic of sleep. We sleep each night and life comes for us in the morning – it’s not always a welcome or well-timed event, at best it is a surprise – it’s a new day and we’re in it. Who of us would choose not to be woken? Life is an invitation that we can refuse for a more comfortable option. Those who generally get their own way, know little of life or freedom. Robyn and I are already counting the sleeps until we see our kids again and do our job…the only job of a grandparent is to “create happy memories”. How does someone embrace life when a ghost lurks within, pointing out the history of failure and disappointments. How does someone who gets a glimpse of life’s potential overcome an active inner monster, trampling over the ruins of broken relationships? A man who has lived on the street for years has recently been housed and we had a conversation this morning. Although he was pleased to be housed and recognised what a significant step he’d taken, he told me that his anxiety was off the scale. It took a while for me to understand what caused the anxiety in what should have been a happy step forward. Slowly it became obvious that the addition of a roof over his head meant the loss of his community. This change seemed to occur just the right time when he’s had some success of not using drugs. 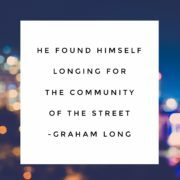 He found himself longing for the community of the street, while at the same time dreading the community that normalises drug use. 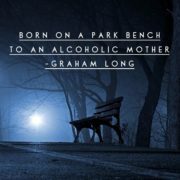 His need for companionship and social support seemed to invite the circumstances where he would lapse again into drug use. “Your greatest weapon” I told him, “is to call things by their real name. Anyone who is willing to see your life collapse on a fast track towards your death, is not a "friend". We talked for a while about what a friend is and is not. 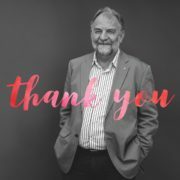 He expressed gratitude for all the support he’d found at Wayside and I was comforted to know he has people here who care for him. Staff and volunteers often tell me of encounters with people that make our spirits soar. One story this week was of a man who had only just nursed his wife to her death. She was a Wayside supporter and on her deathbed, she told her husband that she wanted him to buy some blankets so that the winter would be a bit easier for the people we support. The dear man duly presented himself to our front desk this week, blankets in his arms and tears in his eyes. 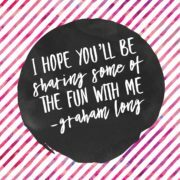 Friends, volunteers and staff sometimes bring people to my office because, “they need to talk to Graham.” Some awkward meetings have taken place at times when it has become clear that the meeting was less than a voluntary act. This week as I walked into my office I found a young woman, who looked as surprised to meet me as I was to meet her. This professional young woman was crying, unable to make eye contact and probably wishing she was anywhere but my office. It’s weird to encounter someone resisting what isn’t asserted. She didn’t have much to say except, “I don’t know who I am anymore”. With eyes that darted around the room, to the floor, then around the room again, she told me that she’d recently lost her job and a partner. 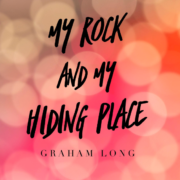 A relationship that had begun with all the intensity of a wild movie had dissipated to a point where the young woman felt invisible in her own home. “Why do people forget to love?” was a question that almost vomited up from the depths of her soul. Eventually we looked at each other. What a face! What a mystery, that this face had been entrusted to another who had stopped looking or perhaps more correctly, stopped seeing. I didn’t fix anything, nor did I claim to know how to. The woman cried and talked a lot and I expect that really eased her burden. However when our faces met, I knew we were truly present to one another. She was not an interesting case for me nor was she a problem to be solved. She was herself, awesome, and beside me. I doubt that we’ll meet again but I will never forget her name and I simply appreciated the gift of her presence. I know she left my room a different woman because when she left, I was a different man. We were gloriously useless to each other and yet each added something priceless.